Fate/Prototype is not an action-packed novel. In fact, you’d probably be disappointed if you expect fight scenes, since there’s barely any of them, and the most exciting one is at the end of the book. Where Fate/Prototype excels in – and what I feel Fate/ stuff in general excels in – is how the characters act and interact with each other. You might have heard the saying: “The best way to a person’s heart is through their stomach.” For Fate/Prototype – it’s better to say that the way through each character’s mind is through their stomachs. There’s a reason why the novel is rife with cooking and dining scenes – these scenes serve as windows to each characters’ feelings. Sajou Ayaka eats microwave-heated food when her father and sister are not around. She watches her sister Manaka prepare breakfast and describes her as if she were a shining angel, a flower in full bloom, or the royal princess of a faraway kingdom. Manaka prepares a grand British-style breakfast – toast with eggs and bacon, salad, milk, kidney pie, fish fillet, steamed potatoes, ham and cheese, porridge and scones; black tea and cut plums for dessert – for her beloved King Arthur. Arthur, in response to the grand breakfast, only says short compliments: “Thanks.” “It’s delicious.” Much of the character interaction is crafted in this way – food and cooking are important parts of the story. Speaking of characters, three of them take center stage in Vol. 1. Sajou Ayaka serves as a viewpoint character – through her eyes, we see the daily life of a family of mages: the cold treatment she receives from her father, the loneliness she endures as her family grows more distant due to the Grail War, and signs of self-deprecation as she describes herself as “average”. Most importantly, we can see how she views her sister, Sajou Manaka: the extolled genius, the flower in eternal bloom, the elegant princess from a fairy tale. Sajou Manaka is vol. 1’s protagonist – the “Little Lady” referred to by the chapter titles. She is the shining beacon of purity, the epitome of a “maiden in love”. But through King Arthur’s eyes, we see something different: something dark and cruel lurking behind the girl who’s willing to sacrifice anything and everything for the sake of her love. And indeed, we see glimpses – fragments – of a tragic conclusion: eight years later, we see no signs of Manaka or her father, and Arthur is somehow Ayaka’s Servant. “Fragments” is an intentional word choice on Sakurai Hikaru’s part – Fate/Prototype is told in story fragments as seen through one Master’s side – in vol. 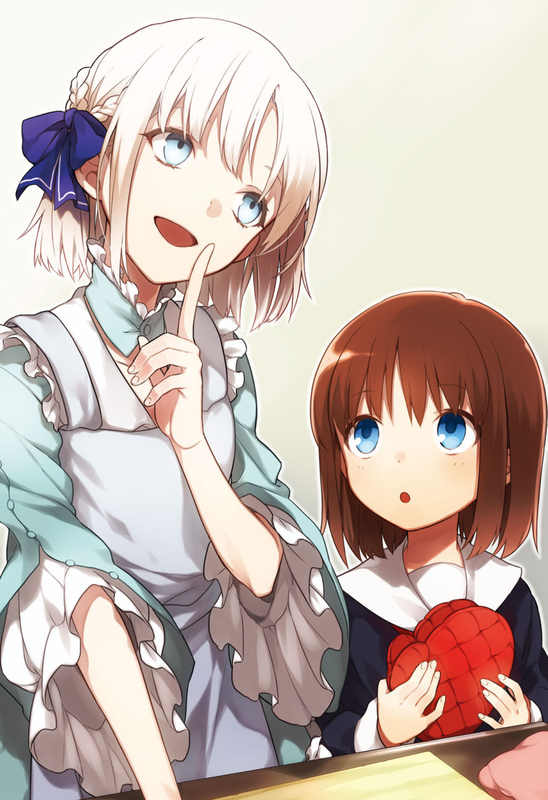 1’s case, it’s Manaka’s side of the Grail War. In the afterword, Higashide Yuuichirou (writer of Fate/Apocrypha) describes Prototype not as a story where Manaka and Arthur fight, but a story where they win. 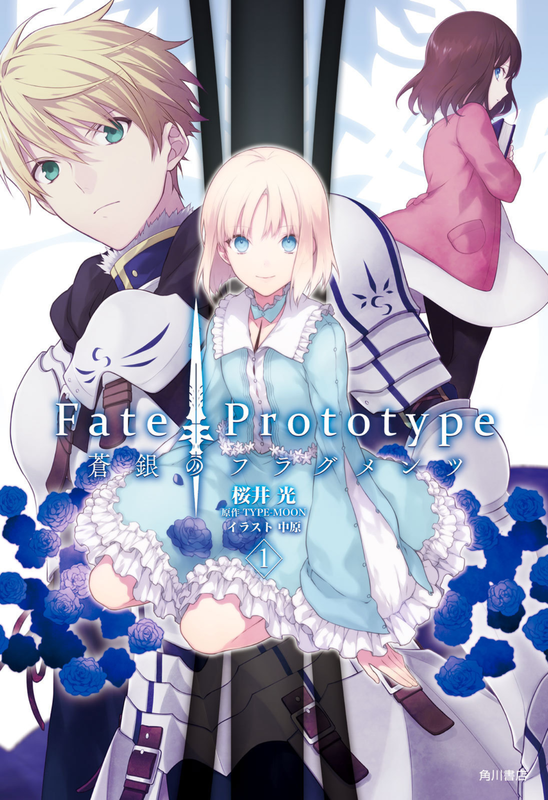 Just like Fate/Zero before it, Prototype is a story with a foregone conclusion, and the fragments will – presumably – fall into place as the story heads to the end. Fate/Prototype is very different beast compared to the rest of the Fate/ franchise. The Grail War itself is not the focus; rather, the Masters and Servants are given center stage, with the War as a backdrop. In other words, Prototype is about the fighters rather than the fighting. I imagine that people who watch or read Fate/ for the battles and power levels won’t enjoy Prototype at all. Sakurai Hikaru’s prose can also be a barrier: her use of repetition is something of an acquired taste from reading her Steampunk Series games. If you’ve ever wished Fate/ would be more focused on its characters than its world-building and fighting, then you will probably appreciate Prototype. Anyone who’s read anything from the Steampunk Series can tell you that Sakurai loves her historical fanfiction, and she even states in Prototype‘s afterword that writing something related to the Fate/ series is like a dream come true for her. Fate/Prototype is a change in direction for the Fate/ series, and it’s only fitting that a huge fan of both Fate/ and historical figures gets to write it. I, for one, am excited to see what Sakurai has in store for the rest of the series. This entry was posted in Light Novels, Reviews and tagged fate/prototype, hikaru sakurai, light novel, review, type-moon by deepbluejeer. Bookmark the permalink.